Purdy and wife Gussie lived in Danbury, CT where they owned a house with tenants and were active members of the church. 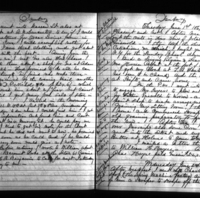 In 1860, Purdy began keeping a diary. His political leanings appear to have been Republican but there was much political activity among both parties in the run-up to the local elections of 1860. Purdy reports on the activities of the Wide Awakes and it appears likely that he belonged to the group but he did not explicitly state that he was a member. He was in the Wooster Light Guards militia company and appeared to have been the secretary. Gussie and Horace socialize frequently with Gussie's parents, Mrs. and Father Griswold who was prominent in the regional church [Methodist?]. Purdy works in a hat shop and is busiest in the Winter and frequently suffers from headaches. He also works in his vegetable garden in the spring growing strawberries, lima beans, etc. 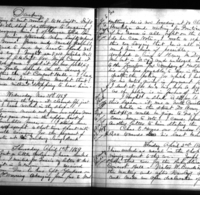 In 1860, his father-in-law who travels to Ohio for the "General Conference." At the outbreak of the Civil War, Purdy joined the 1st Connecticut which was a 3-month enlistment regiment and was organized at Hartford in 1861. It served in the defenses of Washington, D.C. until it was used in an advance on Vienna and Falls Church, VA from June until July 1861. It saw action in the Battle of Bull Run on July 21 and was mustered out of service on July 31, 1861. After his term of service, Purdy returns to Danbury where he eventually transitions from being a hat finisher to selling insurance. Purdy reports on the minutia of his day, the weather and reports on political machinations with occasional editorial embellishments. Allen, Mr. : neighbor to the north of Horace. His little boy's foot was severely injured while he helped Violet Pine chop wood. Dr. William Bennett, home on furlough, treated the wound 3-1863. Ambler, Granville : Delivered the beef bought from Jacob Fry to Horacee 12-1862. Anderson, Emily : visited the Griswolds and attended evening class with them and Horace 1-1861. Gussie and Hattie (Wheeler) visit her with their babies, 11-1861. Horace and Gussie took a walk and visited 7-1862. Ashly, Mr. : editor of the Jeffersonian. Horace takes some of George 's letters to him, to print excerpts of them in the Jeffersonian 12-1862, 1-1863. Took some excerpts from David Mills letters 3-1863. Atlantic Hotel : Bridgeport. Horace and Gussie have dinner there 9-1862. Averrill, Roger - Lawyer : wife died 2-13-1860. Presenter of a flag to Capt. Southmayd's company, 11th regiment at the ceremony 11-1861. As Lieut. Gov., presented swords and sashes to officers of Capt. Moore's company 8-1862. Bailey, Ebenezer : mistakenly took corrosive instead of sugar in brandy 7-20-1860. He died 7-25-1860 and the funeral was the next day at the Disciples Church. Bailey, Mr. : jeweler who works in Mr. Woodford's store. Banks, William : requests a Hatters Society card. A special Hatters Society meeting refuses him 11-1862. Barnum, Thomas : shop proprietor. He sold apples to Horace. Called on Horace and they went over to look at Father Griswold's new house 5-1862. Horace called to see if he wanted a shop at the Pahquioque 7-1862. Barnum, Mrs. Thomas : Gussie visited with her 1-1862. Baxter, Mr. Moses & Mrs. : paid an evening visit to Horace and Gussie (3-1860). Mr. Baxter helped Horace fix his well 5-1860. They lived across the street from Horace. Horace : boarded : with them while Gussie was in Essex during June and July of 1860. Mrs. Baxter visited Horace and Gussie 1-1861. Mr.
Baxter put new hoops on some barrels for Horace 10-1861. Horace hires Moses Baxter to help build his stone wall 4-1862 and build his w ood house 5-1862. Horace brought Mrs. Baxter some crab apples. 9-1862. He built a bridge over a ditch for Horace 9-1862. Horace borrows his wheel barrow 11-1862. Beach, Mrs. : engaged by Horace to help with Fall cleaning. Beardsley, Mrs. : an old friend of Mother Purdy. Horace and family visited her while George was stationed in Bridgeport 9-1862. Bedell, Elizabeth : friend of Gussie Purdy, from Hempstead Long Island NY. Engaged to Henry Mead. Bedient, Oliver : postmaster's clerk 8-1862. Benedict & Nichols' store where Horace shops. Horace bought drain tiles to cross the street 11-1861. Had some pork ground, 1-1862. Horace and Gussie bought carpet there 9-1862. Benedict, Charles : shop owner with residence on Deer Hill. Took in the Widow Phillips : family when their house burned, 4-19-1860. A child of his died of dysentery 8-2-1860. Benedict, Henry : buried 7-5-1862. Benedict, Orin : proprietor of : make shop : in Bethel. Benedict, Starr : owned house at lower end of Main St. which is rented by John Carpenter. Had a small fire there 3-1862. Bennetts : Horace bought some butter and salt at this shop, the first trade he made there 6-1862. Bennett, Curtis : Horace brings pictures to be framed to him 9-1862. Bennett, Dr. E. P. : Horace got lettuce plants from him 5-1860, used his hay cutter 6-1860. Chased the burglars on Deer Hill Ave, 6-23-1860. His property extends to William St. Treating small pox cases 3-1861. Examined Horace and gave him a certificate of exemption from the draft 8-1862. Berry, Brother : Horace walked with him from Bennett's store. Betts, Captain James A. : 5th Regiment. Home on furlough, 1-1862, was taken prisoner, released and home on furlough 8-1862. Bevans, George R. : expelled member of Horace's military unit. Bought cap and axe that had been used by George Eddy. He intends to act as Pioneer in the Bridgeport Washington Guards. Bienneville : steamer that took Horace's regiment to Washington D.C. It departed from Long Wharf in New Haven. 5-9-1862 was the first anniversary of that departure. Blackman's : shop in Bridgeport where Horace takes a watch 8-1862. Bogle, Mr. : owns a boarding house in Brooklyn where Harriet Purdy is staying 3-1863. Bombshell Block : new hat block at the Pahquioque Hat Finishing Shop 5-1862. Booth, D. B. : executed some papers for Horace 3-1863. Boughton, Frances (Frank) : cousin of Horace and Gussie. Wife of John, had a baby boy 11-11-1862. Boughton, John : Cousin. Went to tea at Horace's parents while his wife was in Norwalk, 6-1860. Horace visited his house 6-1862, and visited with Frank since he wasn : t at home. Enlisted in Capt. Moore's Company, with George Purdy, 8-1862. Boughton, Louisa : aunt to Horace and Gussie. Her sister Betsey died in the poor house 4-12-1861. Looking for rooms to rent and rents rooms next door to Horace 11-1861. Moved from Gregory's house near Horace to stay with Frank Boughton, 10-1862. Boughton, Susan : visited Mother Griswold 11-1860. Bradley, David - Enlisted in Capt. Moore's Company 8-1862. Brother of George Bradley. Sick in hospital in Baltimore 9-1862. Bradley, Frederick : married Isabelle Bussing 3-28-1860. Health poor in 7-1860. Horace gets blacking for him to sell since he can : t work in the shop 8-1860. While working in the shop : paid James Hagan's fine and the shop voted it back to him the next day. Bradley, Medad : died 12-16-1862. Briggs, Mrs. - Horace sold her some crab apples : 9-1862. Broas, Josiah : subscription started at the shop to help him 5-1862. Brotherton, Philander : he and his wife were skating on George Starr's pond 1-1863. Brush, John : shopmate at the Pahquioque Finishing Shop. Brought Horace corn meal 11-1860. Went ice fishing at Kanosha with Horace 1-1862. Went off and returned to the shop intoxicated 5-1862. Visited the army camp in Bridgeport 8-1862. At the shop and intoxicated 1-1863. Bussing, Lieut. John W. - member of Horace's military unit. Shopped at the Pahquioque Hat Finishing Shop 11-1862. His wife died 12-30-1862 and funeral was at the Disciples Church. Carpenter, John : house he rents from Starr Benedict is at lower end of Main St. There was a fire which was put out before the Hose could there 3-1862. Chapman, Mr. & Mrs. : visited the Griswolds 12-1862. Chichester, Quartius : put new point on lightning rod for Horace -1860. Horace paid him 4-1862. Chittenden, Bro. : led church class 9-1862. Clark & Fords : one of their clerk's is a player in the church choir. 1860 Edward Barnum works there 10-1862. Clark, Mr. : sent a beef to Horace 1-1861. Coe, Mr. : exchanged with Bro. Pegg and preached at Horace's church 1-1861. Preached again 9-1861, 12-1861. Presbyterian minister 8-1862. Preached sermon on patriotism at Horace's church 3-1863. Conrad, Isabella : Bridgeport. Wrote to George in the army and he sent her letter home for safekeeping 12-1862. Crawford, Rev. John : Redding. His daughter married Charles Stevens. 4-1862. New minister in Horace's church 4-1862. Visited the Griswolds with his wife 3-1863. Crofut, Mr. & Mrs. . : lodgers in Horace Purdy's house 1860. Crofut, Mr. Henry : burglars stole his breakfast 7-24-1860. He owns the Pahquioque hat finishing shop. 4-1862 Trades hats for raisins from a peddler and buys flour on time so sell to his men on credit, due to the panic and not being able to get money 12-14-1860. His father died 2-7-1862. Met with the men in the shop to work out a payment schedule for wages nd pay the back wages owed the men 5-1862. Crofut, Horace B. : a former tenant of Horace. His baby boy was born 6-15-1860. Horace and Gussie visit him. Crofut, Laura : daughter of Mr. Crofut who owns the shop. A piano was put in the office so she could take lessons there. She keeps the books for the shop for her father. Crossman's Stables : Father Griswold buys manure there 12-1862. Curtis, Mrs. : Horace sent her a sparerib of pork because her husband is at war 12-1862. Daniels, Lieut. : of Capt. Stone's company, Col. Ferry's 5th Regiment, returned home from Edward's Ferry on the Potomac MD 12-1861. Sword and sash presented to him 8-1862. Day, Amos - camping in Bridgeport in the same mess of the regiment with George Purdy 8-1862. John Cosier sends him some mittens 12-862. He was one of John Cosiers old Sunday School scholars. 12-1862. Day, Josiah : in the same regiment with George Purdy. Home on leave because his wife is ill 9-1862. Discharged from the 17th regiment, visited Horace at the shop to give him letters George had received and saved. 3-1863. Deming, Capt. M. - wounded in a battle at Charles City Cross Roads before Richmond and died of his wounds 7-1862 , discourse or funeral sermon at the Baptist Church 11-1862. Talk about him scheduled at the Baptist Church but moved to the next day because of the weather 12-1862. 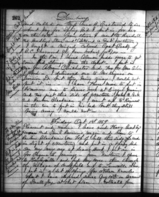 DeWolfe children : Horace fills out certificates of admission to the Sunday school for them 3-1863. Dikeman, Robert A. : member of military company, died in Memphis TN 1-1860. Dickens, Mrs. George : Horace sold her some crab apples : 9-1862. Downs, Seth : went down to the Bridgeport army camp with his team 8-1862. Dunning, Calvin : Was elected treasurer of the Hat Finishers Assoc. 1-1861, 1-1862. Eames, Harris : married Sarah Keeler, one of the Sunday School teachers 12-2-1861. Horace sold Mrs. Eames some crab apples 9-1862. Eddy, George M. : deceased member of Horace's military unit. Fairchild & Gillett : Gussie bought a year of tarltan there 10-1862. Fenner, George : came home with Horace and walked around Horace's property and went with him up into the cupola of Father Griswold's new house 5-1862. Works in the shop with Horace 7-1862. Ferry , O S. : addressed the Republicans in Concert Hall, previous to the election the following Monday 3-28-1861. Lost re-election to Congress 4-1861. Flagler, Theodore - apprentice at the Pahquioque Finishing Shop (1860). Went off and returned to the shop intoxicated 5-1862. Foot, Robert : a young man died suddenly of a disease of the heart 3-1862. Ford, EIias (?) B. - visiting preacher from Ridgefield 9-1862. Foss, Archibald Campbell : Horace heard him preach while in New York to get books for the Sunday School 3-1863. Foss, Cyrus David : Horace went to hear him preach while in New York getting books for the Sunday School. Were disappointed because his brother preached. 3-1863. Fowler, James : Horace gets bushels of potatoes from him 9-1862. Gregory, Alfred : holds a $400 note from Horace on Horace's house. Horace is paying interest on the note . Called and asked for some money which Horace couldn : t give him 9-1861. Horace received $400 from the Board of Relief to give him 1-1862. Temporarily gave note to Jarris Hull as security 4-1862. Griswold, Arthur : cousin of Gussie. Member of the 8th Ohio Regiment, killed at Winchester VA 3-1862. Griswold, Edwin E. : : Father Griswold : , minister, preached in Danbury and Ridgefield (1860). Elected delegate in Stamford CT to the General Conference 4-13-1860. Appointed presiding Elder of the New Haven District at the Conference in Stamford 4-1860. Sold his place to Mr. Valentine 12-25-1861. Moved out of his house and into Horace's upper rooms. Stored some of this things in his new barn and at Horace's 4-1862. Attends Conference in Waterbury. He is only home one Sunday a year because of church duties 4-1862. Visits Elyria, Lorain County, Ohio 6-1862. Griswold, Edwin Luther : b. 2-11-1856. Nephew of Gussie and Horace. Griswold, Fanny : . daughter of Father Griswold (Edwin) and sister of Gussie Purdy. Visited Elyria OH in June and July 1860. Visited Madison WI in July 1860. Returned from Camp Meeting 8-1862. Griswold, Grandfather and Grandmother : grandparents of Gussie Purdy buried in the graveyard in Bloomfield. Griswold, Mary Victoria : died young and was buried in the graveyard in Bloomfield. Sister of Gussie Purdy. Later, grave moved to the Wooster Cemetary in Danbury. Griswold, Willie : Fanny Griswold sends socks to his mother for him 12-1862. Hamilton, Mr. : Texas. Speaking at Concert Hall on the political issues and to aid in Gov. Buckingham's election 3-1863. Hare, Bro. : assisted Bro. Crawford with the service 8-1862. Brother Crawford's son-in-law 8-1862. Harris, Mr. : Horace orders apples from him 10-1862. Horace buys coat, vest and pants from him 1-1863. Harvey : was hired to paint rooms Horace is renting 11-1862. Heath, Alfred : gave money he owed George Purdy to Horace by way of Mr. Swift. 12-1862. Heinman, Henry : baptized 7-1862. HIckock, D. R. : sells patent folding clothes dryers and is the patentee. Horace inquires about getting a sales territory 12-1860. Hitchcock, Henry : servant of Capt. Betts of the 5th Regiment. Home on furlough 1-1862. Holmes, George & Co. : Norwalk. Store burned in large fire 2-1862. Holmes, Stephen : Sewing Society meeting held at his house 3-1862. His boy, Charley died 7-1-1862 of inflammation of the bowels. He was a member of the Sunday School. Holmes, Susan : attended singing party 4-29-1860. Married Dwight M. Baldwin 10-30-1860. Horace states that he is an habitual drinker. Horton, Miss : Sister of Mrs. White. Took dinner with the Griswolds on Thanksgiving 11-1861. Tenant of the Griswolds. Howe, Louise : old schoolmate of Gussie's and Gussie wrote to her 12-1862. Married Mr. Wright 2-1863. 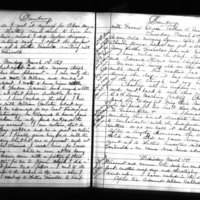 Hoyt, Henry : collected evergreens with Horace and Peter Starr for the church. They used George Starr's team. 12-1860. Hoyt, Mary Jane : sold Gussie Purdy a dress and hat 4-1860. Horace paid here for millinery for Gussie and the baby 11-1862. Hoyt, Oliver : Stamford. Elders of the Church and the Bishop stayed with him during Conference 4-1860. The sound is in full view from his residence. Hoyt, Russel : Horace buys pork from him 12-1862. Hoyt, William C. : former Danbury preacher. Appointed Presiding Elder in the Bridgeport District at the Conference in Stamford CT 4-1860. Visits Danbury and is a guest preacher 1-1862, 4-1862, 10-1862. Is presiding Elder, 7-1862. Hoyt, Zerah : shopped at where Horace works 3-1860. Paid a garnish, 4-1861. Hubbard, Dr. : doctor with the 17th Regiment, Horace writes to him about George. 3-1863. Hull, A. B. : Gussie attended auction (2-1860). Horace ordered butter from him. Hull, Charles : shop proprietor. Horace bought a hoe 5-1862. Horace orders work by a tinner for the lining around his chimney 6-1862. Hull, Edward : he and his men spread dirt in the road over the stones Father Griswold placed there. 6-1862. Hull, Graham : Horace purchased a pot of butter from him 12-1860. Humingston, Tip : Horace looked at a saw he was selling. He is selling out to go out west 3-1862. Humphrey, Eliza : California. Cousin of Gussie Purdy. Gussie corresponds with her. Gussie wries a letter, sends a News Times 2-1863. Huntington, E. S. : buried 4-10-1862. Irish, the - first St. Patrick's day demonstration by them in Danbury 3-17-1863. Ives, Joseph : Horace and Gussie buy bedstead and washstand at his store 9-1862. His wife is buried 12-1862. Ives, Mrs. : came with Mother Purdy and helped nurse Gussie 9-1861. Jackson, Old Mrs. : hired to nurse when Gussie has the baby 8-1861. Not very good and Horace dismissed her 9-1861. Died in Stamford and was brought back to Danbury for burial 12-1862. Jenkins, Capt. : 23rd Regiment. His company came to Danbury and officers received swords and sashes 10-1862. Jennings, Isaac : member of Horace's company, taken prisoner during battle at Bull Run 7-1861. Returned home on the train 6-4-1862. Johnson, Albert : shopped at the Pahquioque Finishing Shop (2-1860) in place of Joseph Tammany. Jones, Mason : gave a lecture on Garibaldi 1-1863. Judson, William : member of a Pennsyvania regiment in McClellan's army. Visited Horace's shop and Horace tried to take up a collection for him 7-1862. Keeler, Lieut. : 5th Connecticut Volunteers. Visited Horace's shop and spoke at Concert Hall to get volunteers 8-1862. Knowles, David : called on Horace at the shop and went home with him 6-1860. Called to see Horace's border, Mr. Smith 12-1860. Horace finished a hat for him 12-1860. Knox, Andrew : elected 1st Sargent of the Wooster Guards 3-9-1860. Treasurer of the Wooster Light Guards 12-1860. Painter. Horace borrowed money from him for his trip to Hartford County 8-1860. Presented bill to the band with Horace 10-1861. Lieutenant in the 1st Conn. Artillary and came home on furlough 7-1862. Ledger, Harry - 'shopped : , worked in the shop with Horace. 8-1860. Horace sold 20 heads of cabbage to him 11-1861. Subscripton started at the shop to help him go to England for his health 5-1862. Lilly. Patrick - of the 1str Conn. Heavy Artillary. Died in hospital. Horace and other volunteers under Capt. Wildman and Jackson's Cadet Muskets turned out for the funeral and the burial in the Catholic burying ground 3-1863. Loomis, George - apprentice at the Pahquioque Finishing Shop (1860). Off on 9-11-1860 to go to wool hatting at Sturdevant's. Dismissed from the army because of wounds, came back to Danbury 12-1862. Lounsbury's : shoe store where Gussie buys shoes 3-1862 . Horace has his mother knit some mittens for George 11-1862. Lounsbury, William : gave boxes for items to be sent to the soldiers 9-1862. Lovelace, George : Constable, served notices of the draft 9-1962. Mallet, Mr. : Redding. Offered to lend Horace $1100 to consolidate 2 notes and a mortgage on Horace's property, to be paid annually instead of semiannually. Horace gave him his mortgage deed and insurance policy to secure the loan 3-1863. Mallory, Kate : New Haven. Formerly of Danbury and friend of Horace and Gussie. Manley, Daniel : gave Horace a new variety of potatoes, 5-1862, some turnip plants 7-1862. Was not able to get a military exemption 8-1862. Bought some cider from Horace 12-1862. Mason, Charles : clerk for Noah Hoyt. Delivered the bottles of ale that Horace had ordered from Randall's. 6-1862. Maynard, Brother James L. : elected Sec.-Treas. of the Sunday School Teachers 4-8-1860. Resigned 1-21-1861 because he was leaving town 1-22-1861. Wrote to Horace from East Haddam (North Lyme) 2-1861. McDonald & Ford : dry goods store, had a fire 2-1861. McDonald, Bro. : led the evening meeting 1-1863. McDonald, Mr. : owner of horse and sleigh (1860). McDonald's Blacksmith Shop . Horace paid him money owed for milk 12-1861. Horace paid Mrs. McDonald 3-1862. George borrows his horse and carriage to go to Bethel 8-1862. Horace shot with pistols at a target in his orchard 11-1862. McNeil, Mr. : painting Father Griswolds house, took tea at Horace's since his wife was there dressmaking 10-1862. Mead, Elizabeth Bedel : Hempstead, L.I. Wife of Henry. Writes to Gussie 9-1861. Gussie receives a letter from her 9-1862, 11-1862. She visits from Brooklyn 3-1863. Lives near Classon and Green aves. In New York city 3-1863. Meriden Britanic Co. : Horace bought spoons in Danbury from a salesman of the company 11-1860. Miley, Brother and Sister. Brother preaches (1860). Last day as pastor in Danbury 4-8-1860. Appointed to Forsyth St., NYC at the Conference in Stamford 4-1860. Some of Capt. Moore's company attended his church in Bridgeport and Mr. Thompson preached. 8-1862. Mills, Charles : cousin of Horace. With the First Minnesota Regiment at Harpers Ferry 3-1862. Near Yorktown in the army under McClellan 5-1862. Sick in the hospital at Frederick MD, becomes steward of the Jail St. hospital in Frederick MD 10-1862. Home from the war 3-1863. Mills, David : Cousin of Horace , visited Horace and Gussie in the evening then went up home with George Purdy 12-1860. In the 5th Connecticut regiment (3 year troops) , is in Capt. A. Betts company, general Banks Division and is the Adjutant's Orderly 1-1862. Prisoner in Richmond and recently released 10-1862. With his regiment at the Jail St. Hospital in Frederick MD, provost guard duty 11-1862. Mills, Aunt Harriet : Bethel. Came up on the train for a visit 6-1862. Moegling, Maj. William : home on leave, wounded in the leg while with the 11th Regiment of McClellan's army, chasing the rebels on the upper Potomac. 9-1862. Promoted to Lieut. Col. Because his Colonel died in the battle 10-1862. Monahan, Father : the Catholic priest in Danbury, lectured at Concert Hall on St. Patrick's day 3-1863. Moore, Capt. : of the 2nd Company Volunteers, returned to Danbury 8-1861. Plastered Horace's new chimney in the sink room 6-1862. Was forming a new company with the 17th Regiment, and many men enlisted after the Governor's speech 7-1862. Sword and sash presented to him 8-1862. Moorehouse, Aaron : starting an association with George Purdy and others for young men. Horace is proposed for membership 4-1862. Took over assisting in the library duties at the Sunday School 8-1862. Borrowed Sunday School minutes from Horace to copy the bylaws 12-1862. Paid $1 to Horace for the use of George's melodeon. 12-1862. Morris, Granville : brought at letter from George to Horace 8-1862. Morse, Ira : Horace bought cloth from him for George. George was measured and the cloth cut so Mother Purdy could sew the pants 3-1862. Nash, Albert : Bridgeport. Preached in Horace's church 11-1861. Newman, Edith : Horace left pictures of George with her, per George's instructions 9-1862. George sends money in a letter to her for Horace to deposit 12-1862. Olmstead, Mr. : smoked Horace's hams and shoulder 2-1862, 1-1863. Otis, William : At Camp Aiken in Bridgeport in the same mess of the regiment with George Purdy 8-1862. Some items sent to him 9-1862. Pahquioque Hat Finishing Shop : shop where Horace works. Men agreed to stop taking orders until Mr. Crofut paid them as other journeymen are paid, regualrlarly, on time and in cash. Palmer, Phebe J. : Stamford CT, cousin of Horace Purdy, daughter of Abigail. She visited Danbury . 1860. Visited George at camp in Bridgeport 9-1862. Palmer, Edmund : Eddie : - Stamford CT, cousin of Horace Purdy. Visited Danbury and Ridgefield. 1860, 8-1862. Parsons, Charles C. : cousin, a lieutenant in the regular army, expected on the train 2-1863. Pease, H. F. : Bethel. Preached at Horace's church 12-1860. 2-1862, 10-1862. Pegg, John, Jr. : appointed to Danbury church at the Conference in Stamford CT 4-1860. Previously in Hartford. Horace stays overnight at his house in New York city on Forsyth St. 3-1863. Phillips, Widow : residence on Deer Hill burned 4-19-1860. Went to stay with Charles Benedict, her neighbor on the north. Pine, Alex : came to get dirty clothes for his wife to wash. 11-1862. Pine, Jane : helped Gussie and Horace clean house 9-1862. Pine, Violet : little colored girl across the way from Horace and Gussie. Mr. Allen's son injures his foot while cutting wood with her 3-1863. Pine, William : Horace's colored neighbor. His baby is baptized at Horace's church, 9-9-1860. Powell, Mrs. Adelia : Brooklyn NY, came with Fanny Griswold from New York for a visit. Sister of Mrs. Elizabeth Mead 3-1863. Powell, Gideon : Brooklyn, Fulton Ave. Horace stayed overnight with him and his wife 3-1863. Prince : the cat (1860, 6-1862) Horace killed him while weeding 6-1862. Pulling, Smith : 'shopped : , worked with Horace 8-1860. New daughter 2-1862. Purdy, Edwin Augustus : son of Horace and Gussie born 8-29-1861. Baptized 3-12-1862. Had diphtheria 1-1863. Has trouble walking 3-1863. Purdy, George : birthday 8-13. brother of Horace Purdy. Librarian of the Sunday School : 1862. Procured a situation at Sturdevant's Factory 7-1862. Joined Capt. Moore's company, 17th Regiment 8-1862. Went to Camp Aiken, Bridgeport to train 8-1862. Regiment stopped at Fort Marshall at Baltimore 9-1862. Sick in hospital in Baltimore 9-1862. Near Hopeville Gap, near Thoroughfare Gap on the Manassas Railroad 11-1862. Sick with fever, in the hospital at Brooks Station on the Aquia and Falmouth Railroad 3-1863. Purdy, Harriet : Horace offers to have her stay with them while she is out of work. She declines because she has found some sewing work 1-1861. Horace talks to her about her behavior and she is upset 9-1861. She is staying at Mr. Bogle's boarding house on Clermont Ave. near DeKalb in Brooklyn where Horace visits her 3-1863. Purdy, Hart : cousin of Horace. Helped with the sink room chimney and was paid by Horace 6-1862. Purdy, John : brother of Horace Purdy . Born 5-11-1837. Died in 1857 and buried in cemetery on present day Kenosia Ave.
Purdy, Mary : Cousin of Horace. Came over in the evening to watch the baby for Horace and Gussie 11-1861. Walked up the the cemetery with Gussie 5-1862.Visited Horace with George Hall 7-1862. Randall's : Horace purchased a bottle of ale to try 5-1862. Raymond, Avery : Horace bought a shad from him 5-1862. Lobster from him 7-1862. Reed, G. H. & Co. : shop where Horace has an account. Richards, Mrs. : called on Gussie and Horace 5-2-1860 , 8-1861. Injured by a runway horse 7-1862. Rider, George : has a team and Horace engages him to do some work for Father Griswold 11-1860. Robinson, Rev. Mr. : pastor or 2nd Congregational Church, preached in the Baptist church on Thanksgiving and Gussie attended 11-28-1861. Read Washington's farewell address on the holiday 2-1862. Rogers, Brother Charles : New York : came to visit the Griswolds 3-1860. Rooney, John : youngest apprentice at the shop where Horace works 1860. Went to the bank for Horace to draw a check 2-1861. Almost enlisted in Capt. Moore's company 7-1862. Rowan, John : sewing society meeting at his house 4-1861. Has been blind for years but went to New York to have his eyes operated on and his sight has improved. Horace and Gussie call on him 5-1862. Sanford, E. A. : at Starr's Arms Factory, Yonkers NY. Horace writes to him to get a position for George. 8-1862. Sanford, Mrs. Theodore : sister of Robert A. Dikeman, soldier who died in Memphis TN. Sayers, Mr. : the cart man. Sayers, Robert : brother of the cart man Sayers. Treasurer of the Danbury Cornet Band 1860. Mother Purdy attended the funeral of his child 7-1862. Seeley, Aaron : his wife died 3-21-1862. Seymour, Old Mother : died 6-20-1862. Shaw, Jacob : preacher from Redding preached at Horace's church. Skinner, Mr. : travels around introducing good literature and visited the Sabbath School. Studying for the ministry, preached in Horace's church. Is selling subscriptions to the Atlantic Monthly 12-1860. Small, Charles : Horace buys a used baby carriage from him 11-1861. Went ice fishing at Kanosha with Horace 1-1862. Shopmate of Horace 7-1862. Enlisted in Capt. Moore's Company 8-1862. They received word that he had died 10-1862. Body came by train and funeral was 10-6-1862. Smith's News Office - Horace paid for copies of the Theological Compendium 6-1862. Taken over by Mr. Swift 7-1862. Smith, Richard : his father is buried from Horace's church 11-24-1861. Sniffins, Saul : at Hatters meeting, he was denied a card 7-1862. Soule's Pills : the agent came by for payment for the pills he had left with Horace 2 years ago, and Horace returned the pills 6-1862. Southmayd, George M. : Captain of the Wooster Guards. Used his hearse for R. Ae Dikeman's funeral procession to the cemetery. Resigned as Captain 3-2-1860. His shop burned 6-25-1860. Elected Captain of the 5th company, 11th regiment 9-1861. Stationed in Hartford 11-1861. Home on furlough 6-1862. Starr & Barnum : shop where Father Griswold got manure and muck 11-1860. Where Horace got shavings 1-1861. Starr, 1st Lieut. : 23rd. Regiment, in Capt. Jenkins company, received sword and sash 10-1862. Starr, George : Brother in the Church. Elected Superintendent of the Sunday School Teachers 4-8-1860. Horace built a cabinet for curiosities for his brother George at George Starr's shop 12-1860. Horace used George Starr's horses to collect ever greens for the church 12-1860. Sewing society meets at his house, 1861. Horace and Father Griswold obtained shavings from his shop 9-1861. Horace made a 'skit box : for George for Father Purdy 1-1862. Horace gave him a picture of George Purdy 9-1862. Horace went skating on his pond 1-1863. Stevens, Charles T. : wife died 2-13-1860. Tailor, made vest for Father Griswold, clothes for Horace. Brother in Horace's church 12-1860. In Horace's military unit and went to Hartford from New Haven to procure overcoats with Judah Crosby 4-1861. Horace orders vest 3-1862. Attended church with his bride (his third wife), Rev. John Crawford's daughter of Redding. Horace purchased blue flannel from him 11-1862. Visited the Griswolds with his wife 3-1863. Stevens, William : Englishman. Neighbor of Horace who was evicted by Sherriff. Gardner? Stone, John : his wife and her sister were injured by a runaway horse 7-1862. Stone, Mr. : Baptist preacher exchanged places on a Sunday with Bro. Pegg 8-1861. Spoke at Concert Hall at the return celebration for Capt. Moore's company. Church remodeled and finished by 11-1861. Gave a lecture on the Army of the Potomac, 1-16-1862. His office used by Draft Board review exemption requests 1-1862. Spoke at Taylor funeral 2-1862. Visiting Europe 7-1862. Preached funeral sermon for Lieut. Col. Stone and Gussie and Horace attended 2-1863. Swift, Mr. O H. : took over Smith's News Office . Selling Griswold's Family Salve on commission for Horace, 7-1862. Was a prisoner with Charles Mills in Richmond 10-1862. He and his wife leave Mr. Hurd's and rent 3 rooms from Horace 11-1862. He and his wife move out 3-1863. Taylor, Anna : received a letter from George and it had a note for Horace requesting him to buy and send stamps to him 10-1862. Taylor, Mary - cousin who died on 6-4-1862. Buried on 6-5-1862. Thompson, Dr. : truss maker in Danbury 8-1860. Horace bought a truss from him 3-1862. Thumb, General Tom : exhibited in Danbury 11-1860. Thompson, Mr. : acting chaplain in Capt. Moore's company, preached to the men in Bridgeport and preached at Bro. Miley's church there. 8-1862. Underhill, Marianne - school mate of Gussie at Amenia Seminary. Wrote to Gussie 3-1863. Valentine, Mr. : bought Father Griswold's place 11-25-1861. Horace spoke with him outside Horace's house 6-1862. Warren, Mr. : rents rooms from Horace 3-1861, 8-1861. Had an accident with his axe and Horace dressed his wound 2-1862. Moved out 4-1862. Warren, Rufus : Horacetakes a watch for him to a shop in Bridgeport, Blackman's 8-1862. Warren, William : has enlisted and is at Camp Aiken in Bridgeport. Came home and took up his role as Assist. Librarian 8-1862. At camp with George and wrote a letter for George who was sick with fever 3-1863. Watson, Susan : visited Gussie and Horace 10-1860. Bought items for Gussie and Frank Boughton in New York 11-1860. Visited the Griswolds 1-1862. Webster, Grandfather and Grandmother : mother and father of : Mother : Purdy. Grandparents of Gussie Purdy. Buried in the cemetery in Bloomfield. Weed, George : brought a letter from George at Camp Aiken in Bridgeport 8-1862. Wheeler, Abel : husband of Harriet . His folks live in New Fairfield 8-1861. Horace orders wood from him to build a wood house 4 -1862. Helps Horace with the tin around the new chimney 6-1862. He joins the army and is in New Haven training 9-1862. He and his regiment, the 23rd, are in camp near Jamaica, Long Island 11-1862. His regiment is in Banks Division, stationed in New Orleans 2-1863. Wheeler, Harriet Stevens - Married to Abel Wheeler. Had a son born 8-30-1861. Visits Abel in Brooklyn with Josie to see him off with his regiment 12-1862. Wheeler, Josie : daughter of Able and Harriet 4-1862. White, Colonel : Horace went ice skating on his pond 12-1860. White, Maria - Elected Female Superintendent of the Sunday School Teachers 4-8-1860. Presented with a pronouncing Bible with other officers and teachers of the School and is moving to Peekskill 3-1862. Wilcox, Mrs. : accompanied Mrs. Joseph Young to Horace's house when Mrs. Young picked up the pay for her husband. Wildman, Lucy : received a silver cup for bringing in the second most scholars to the Sunday school 1-1862. : Converted : 2-1862. Daughter of Mr. and Mrs. Russell Wildman 7-1862. Wilson, James : visited with Horace and Gussie while they were in Bloomfield. Witherspoon, William : brought pepper seed to Horace 5-17-1860. He and Horace treated the shop because of his and Horace's new babies 10-1861. Elected Secretary of the Hat Finishers Assoc. 1-1862. Horace got cabbage plants from him and gave him some lettuce plants 5-1862. Horace sold him a tree 11-1862. Works with Horace at the shop and Horace gave him some vinegar 3-1863. Woodruff, Brother George W. : Waterbury - Preached in Horace's church in place of Bro. Pegg 1-1861. Also preached 2-1863. Wright's Paint Shop : where Horace buys paint 7-1862. Wright, Mrs. Louise : Gussie wrote to her, an old school mate 3-1863. Young, Joseph : elected 3rd Corporal of the Wooster Guards 3-9-1860. Works in the shop with Horace, 7-1862. Visited Horace then went over to Granville Ave. to visit his lady, Mary Prior. Got a military exemption, 8-1862. Married 9-17-1862. Visited Horace with his wife; picked up and delivered Horace's letters 10-1862. Went to New York so his wife brought his chits to Horace so Horace could take care of them on payday. 12-1862.